As you all might know, sexism, racism and homophobia are unfortunately still part of the football world. This goes for both players and ultras. Even though there has been progress, female fans and female football players are still not fully represented and chants that are essentially misogynistic are prevelant around the world. 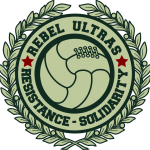 But partially due to the efforts of antifa ultras and social media, fans and players who engage in such behavior are called out and have disciplinary actions taken against them much quicker. Earlier this week, Dutchman Ryan Babel, former forward of Liverpool and Ajax and now playing for Turkish club Beşiktaş, came under harsh criticism from fans after a response on Twitter to (presumably) a fan of Kaşımpaşa, another Turkish club Babel played with. 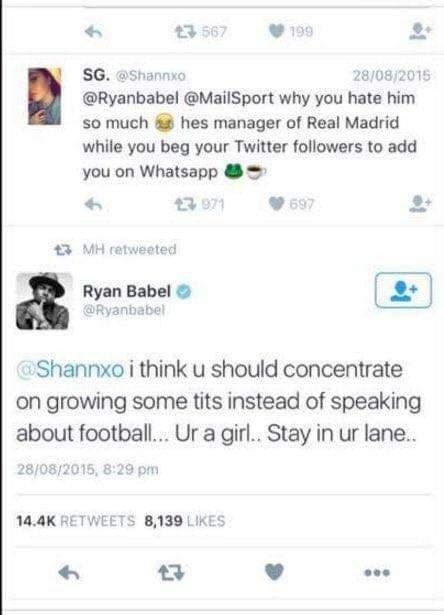 When asked by the fan ‘if he wanted to earn 200.000 again’, Babel responded: “would you want me to date your mom again?”. It's better to be talentless player than being one of the best player who is sexist like you. This remark was immediately condemned by Beleştepe, an antifascist amateur football team from Istanbul, of which most members are also Beşiktaş fans. Beleştepe has done a lot of great work, including protests during the Gezi Park riots and teachers who were on hunger strike after they were fired by the government. After the statement of Beleştepe, other Beşiktaş fan pages expressed anger over Babel. 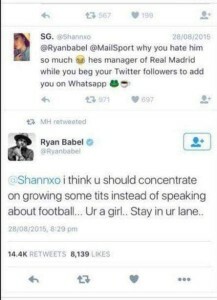 One page on Facebook even found a tweet from 2015, where Babel made clearly sexist remarks to a female Tweeter. The official media outlets of Beşiktaş announced that disciplinary action will be taken against Babel, who has now deleted his Instagram account. During the World Cup in Russia this year the French international Patrice Evra came under fire after an incident during a segment on the British tv channel ITV. England women’s international and former Chelsea player Eni Aluko gave a detailed analysis of Costa Rica’s playing style after their match against Serbia. After she was finished, Patrice Evra started clapping and saying: “that’s very good”. A few moments later Evra repeated this when Aluko complemented Serbian player Sergej Milinković-Savić. Host Jacqui Oatley asked him if he was going to compliment Aluko’s knowledge all day, to which Evra replied to his co-guest Henrik Larsson that he was impressed and that he and Larsson should leave because Aluko knows more about football than they do. Although Evra later stated that his admiration was sincere and that he and Aluko worked on more segments together during the tournament, his behavior was criticized as sexist by people on social media. Aluko was the only female pundit during the World Cup, together with former Arsenal player Alex Scott. Jacqui Oatley became the first female commentator on the BBC’s Match of the Day show in 2007, which resulted in headlines from the tabloids. Oatley found it absurd that the fact that she got a new job in a field in which she had worked for years, became national news. During UEFA Euro 2016, a Twitter user suggested that ‘she should be at home cooking dinner’. A letter of complaint was written to the Sheffield Star by a man who was complaining about the ‘high amount of female reporters’. Comments like this show that women are still not fully accepted as knowledgable and passionate about football, both on and off the field. Nonetheless, during the 2018 World Cup, the amount of female commentators and pundits increased worldwide. “One of the biggest barriers to women in football is this archaic idea that women don’t understand the game, but viewers are going to see these incredible, talented women who are knowledgable and natural”, says Anna Kessel, co-founder of Women In Football, a UK-based network of women who work in and around the football industry. Kessel couldn’t be more right, it is time for football to step up the game and make women visible. After all, it is everyone’s game. Previous: Omonoia 1948: They didn’t begin, they’re continuing!